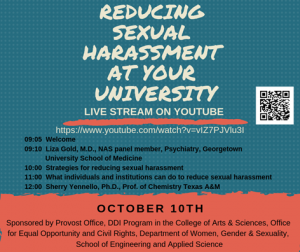 The event Reducing Sexual Harassment: A Day of Discussion will be live streaming between 9:05 AM and 12:30 PM on Wednesday, October 10, 2018. Ever wondered what you could do personally to reduce sexual harassment in your environment? This event is designed to help people take individual and institutional action. This is not an event for just women, it is an event for everyone. Participate wherever you are! The National Academy of Science (NAS) report on sexual harassment sparked the organization of this event. The NAS panel reports, based on the best available studies to date, that more than 50 percent of women faculty and staff report having been harassed. Student surveys of university systems show disturbingly similar high rates, with 20–50 percent of women students experiencing sexually harassing behavior perpetrated by faculty/staff. One main conclusion of the report is that the academic culture needs to change in order to reduce sexual harassment. We are all each a necessary component of this change. Hope to have you join us from afar!